Hi friends! It's Friday! Woohoo! I'm excited! This week went by a bit faster however it wasn't much easier. I'm hoping it eases soon, it's taking a toll on everyone. But we are READY for the weekend! Have a great weekend everyone! And check out the Unity Blog to see all the participants for this week's Friends With Flair. This is beautiful, Ashley! I love the soft colours and the doily background. 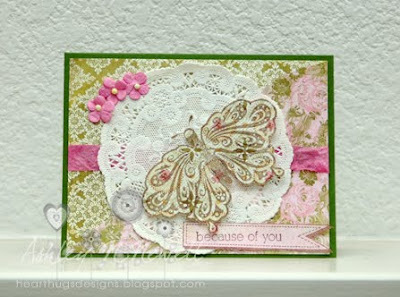 I love your clors and floers and the pretty ribbon too! so beautiful, soft and pretty! Love the pink and green together. Great card. Ashley, this is absolutely lovely and gorgeous! Wishing you and yours a blessed Thanksgiving! Super super cute! I LOOOOOOOOOVE that butterfly and I love love love those colors! They are probably my fav to work with! FUN! LOVE IT! HTURT!! !